Successful together – with passion! The key to our success is our excellent personnel. Every one of them is involved with a great deal of commitment and heart. Whether on the client’s premises or in the office with fellow workers – you will be inspired by our team-oriented work and trusting, appreciative corporate culture. We will convince you with demanding tasks and clients that will bring you further. You work autonomously, have space for your ideas and can take over responsibility at an early stage. As a member of HLB International, one of the world’s leading networks in the sectors of auditing and tax advice, you will be working on international issues and can gather experience abroad. We always have your future firmly in view – we support you with our comprehensive personnel development concept and can offer you excellent career development opportunities, as well as a great working climate. Welcome to the Treuhand team: Enjoy business. We are optimally prepared for the constantly changing requirements of the complex world of work. Our excellent personnel development concept supports your training and further training with comprehensive internal and external offers. For example, we consolidate your specialist knowledge and support you in your personal development. To enable you to focus completely and fully on sitting your professional examinations, we provide you with a wide range of support with regard to time and financially. This is how you build a career! Balance is everything – it is our employees who make us what we are, who are involved with great commitment, passion and experience, and lead us to success. We believe that a good balance between work and private life is elementary for satisfaction and performance in the workplace. Our employees are very close to us – and this is why we support good compatibility with convincing framework conditions and offers, and in addition provide various social benefits. 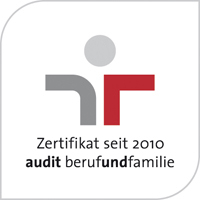 Since 2010, our commitment to family-and life-phase-oriented personnel work has been underlined by the certificate “Work and Family” from the Hertie Foundation.